A baseball short story for young readers. Relive the excitement of the 1925 World Series between the Pittsburgh Pirates and the Washington Senators with Tom, a black cat from Butler, Pennsylvania, as he overcomes adversity to help the Pittsburgh Pirates fight their way back from the brink of elimination to become World Series Champions for the second time in team history. Inspired by a true story. Ages 5-10. 42 pages. Hardcover Edition. Written by Kirk Aurandt. Published by Admiralty Record Publishing Company, L.L.C. 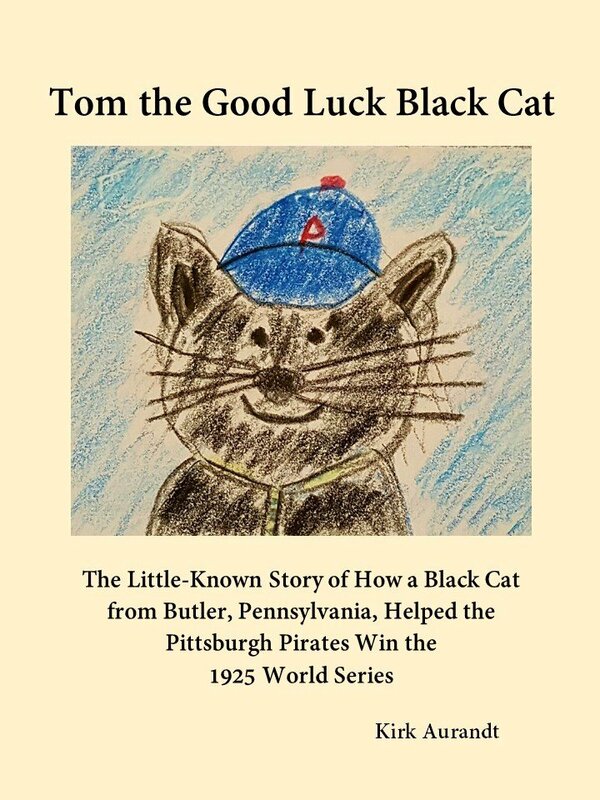 Title: Tom the good luck black cat : the little-known story of how a black cat from Butler, Pennsylvania, helped the Pittsburgh Pirates win the 1925 World Series / Kirk Aurandt. Description: Mandeville, Louisiana, U.S.A. : Admiralty Record Publishing Company, L.L.C.,  | Interest age level: 005-010. | Summary: "Relive the exciting 1925 World Series between the Washington Senators and the Pittsburgh Pirates with Tom, a black cat from Butler, Pennsylvania, as he overcomes the expiration of his good luck card to help the Pittsburgh Pirates come back from the brink of elimination to win their second World Series Championship in team history. Inspired by a true story." -- Provided by publisher. Subjects: LCSH: Black cats--Pennsylvania--Juvenile fiction. | Fortune--Juvenile fiction. | Baseball--Pennsylvania--Juvenile fiction. | Pittsburgh Pirates (Baseball team)--Juvenile fiction. | World Series (Baseball) (1925)--Juvenile fiction. | CYAC: Black cats--Pennsylvania--Fiction. | Luck--Fiction. | Baseball--Pennsylvania--Fiction. | Pittsburgh Pirates (Baseball team)--Fiction. | World Series (Baseball) (1925)--Fiction.